Not ten days ago, life was filled with "doom and gloom", as I anticipated a most likely view for Marquette to finish 9-9. However, fresh off the team's first ever 3-0 start to the Big East, Marquette would need to only finish 6-9 in order to end up 9-9. Therefore, with some more data, I wanted to take a look at the most likely scenarios as the team is playing right now. Really can't emphasize that enough. As the team is playing right now. Again, based on how the team (and our opponents) have been playing, there's not a lot I'd quibble with. The story is a lot better for Marquette, with the opportunity to be favorites in several road games, with no predicted home losses. I'd say the win percentage is probably too high for the Syracuse and UConn home games, and probably too low for the UL and Pitt road games. More games will get more accurate. But what is the most likely scenario for the rest of the season? 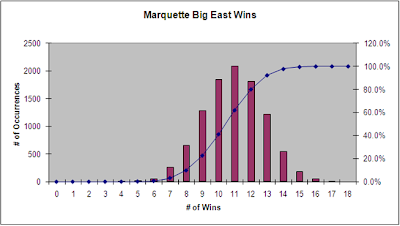 Right now, the most likely scenario is that Marquette will finish with the same record as last year (11-7). Given the model, the view is far more optimistic than pessimistic. Optimist - 90% chance that the team will finish with a record of 9-9 or better. 60% chance that the team will finish with the same record as last year. 40% chance that the team will improve on last year's record, with a crazy 20% chance that the team will get to 13 wins. Win tomorrow, and the team virtually assures itself a 0.500 record or better, with a 27% chance at 13 wins. Pessimist - There's still a 40% chance right now the team ends up a worse record than last year, and a 25% chance they don't break 0.500 in conference. Lose tomorrow and the most likely scenario drops to 10 wins, with a 90% confidence of finishing with no more than 12 wins. 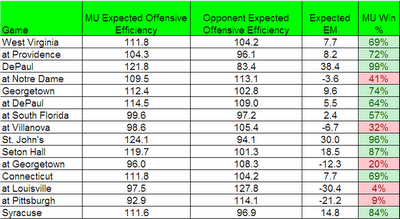 For me, the key to the game was actually the eFG% that Marquette was able to achieve against Rutgers, especially since Rutgers was #12 in the country at eFG% defense. Marquette did a great job shooting the ball. Considering how often Rutgers coughs up the ball, only forcing a turnover rate of 23.9% was actually kind of a letdown. In addition, Marquette had a big advantage at Free Throw Rate, but it was much less significant that the turnovers or shooting percentage. I picked this as one of three games to fly to Milwaukee for (along with Villanova and Gtown) because I think tomorrow's game against West Virginia is the toughest until we hit the final 5 games of the year. Pomeroy has WVU beating us tomorrow, and they seem to have four really good 6-foot-8 guys. I say this because I think a win tomorrow would be bigger than most people realize and could put us on a path similar to your projection box - a loss could indicate we are closer to Pomeroy's 29th ranking. Let's face it, we could lose any or all of our last 5 games, that is a murderers row, so I think we need a win against WVU to help us roll through the season until then.